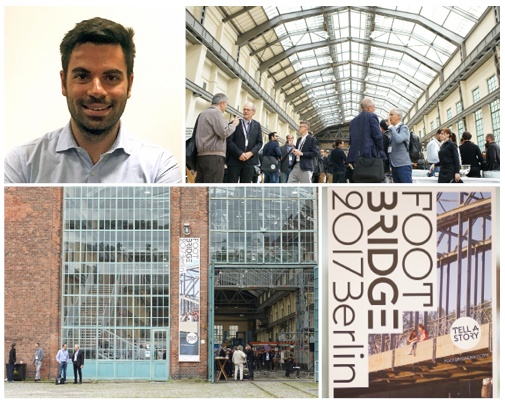 Recently appointed Senior Bridge Engineer, Dario Feliciangeli, has presented a bridge design on behalf of Meinhardt at the 6th International Footbridge Conference in Berlin. The conference which takes place every three years brings together bridge designers and builders from all over the world to share their views and exchange ideas. Dario presented his footbridge design for the city of Berlin (Moabit Area). The bridge – a 56-meter truss – uses innovative construction methodology and sustainable materials, combining a stress laminated timber deck with underslung cables. The design, which has been published in the book ‘World Footbridges for Berlin’ (Jovis), allows the bridge to be built by people with no special construction tools or experience. Prior to joining Meinhardt, Feliciangeli worked at HNTB and Mott MacDonald as a Bridge Engineer and has been involved in numerous major bridge projects including Kosciuszko Bridge, Squibb Park bridge in New York and Mockingbird Bridge in Dallas.